Our youth group is a great opportunity for our youth to find fun, fellowship, and Christian formation with other young people their age. We have teaching catered to our junior high and senior high age youth, fun and games (the kids love this part! ), food and fellowship, and special outings and mission trips. Junior High Youth Group is for students 5th through 8th grade. Meeting on Tuesday evenings from 6:30-8:00pm. Your child will enjoy Bible study, prayer, games/activities, and snacks. We focus on topics relative to Junior High students and the many challenges they face daily, as well as their growth in coming to know Jesus Christ. This is a great opportunity for preteens / teens to develop lasting relationships with Christians their age. Our program includes: outside activities may include: bowling, swimming, movie nights, skating, horseback riding, canoeing, etc., service projects (serving luncheons, helping with Little Star Sunday, serving at dinners), retreats, and an opportunity to serve in a summer mission project. 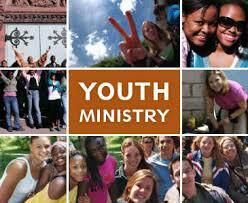 Senior High School Youth Group is for students from 9th grade to 12th grade. We meet on Tuesday evenings from 6:30-8:00pm. This is a great opportunity for teens to get involved in the church and help strengthen their relationship with God.